Chelsea's France Under-20 international Gael Kakuta has moved across west London to join local rivals Fulham on loan for the remainder of the season. The 19-year-old was at the centre of a major row in 2009 when he was accused of breaking his contract with Lens two years before in order to join Chelsea. Both Kakuta and Chelsea were given bans that were subsequently overturned. Another Chelsea youngster, Patrick van Aanholt, has joined Leicester on loan for the rest of the season. The 20-year-old Dutch left-back, who joined Chelsea from PSV Eindhoven in 2007, spent much of last season on loan at Coventry and Newcastle. Kakuta becomes Fulham's second January signing following the permanent capture of Steve Sidwell from Aston Villa. The Lille-born winger has started only five games at Chelsea but signed a new four and a half year deal last month. Last week, the Fulham manager Mark Hughes said of Kakuta: "He's a player I know and I like the qualities he has." The same day Chelsea manager Carlo Ancelotti said he was considering whether it was a good idea "for a young player to have experience on loan for six months". Kakuta's time at Chelsea has not always been a happy one. He has made 16 appearances for Chelsea but only those five starts and was an unused substitute in Monday night's 4-0 Premier League win over Bolton. In 2009, he suffered a fractured ankle which kept him out of action for six months. is there a plan being set in place for our better youth players to get as much first team action as possible before next season? Later that year, he was banned from playing for four months and given a fine of more than £670,000 by Fifa for allegedly breaking his contract with former club Lens. Chelsea were also fined and banned from any activity during two transfer windows. The club appealed against their punishment, claiming that Kakuta did not have a valid contract with the French club. The sanctions were lifted by the Court of Arbitration for Sport in February 2010. 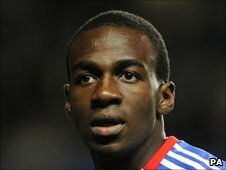 Kakuta has played for France at every level from Under-16 to Under-20 and in December 2009, aged 18, became the youngest ever player to represent Chelsea in the Champions League.